A Passport to Washington Libraries: How many libraries can you visit? Andrew Carnegie helped Washington communities build 43 libraries and that many are still used as libraries today? There is a library in Washington that used to be a bank and contains a vault? A Washington library has a jail cell inside? A library in Washington state is contained in a beautiful old craftsman house? A Washington library has won numerous architectural awards? Will you be traveling around Washington this summer? Why not explore our state’s libraries? Stop along the way and discover just what our wonderful libraries have to offer! Take a photo at each library you visit and enter the Passport to Washington Libraries gift card drawing! Visit five libraries between June 15 and Sept. 15, 2018, and you’ll be entered in a drawing for a $100, $75, and $50 bookstore gift card. Pick a catchy code name to use when you add your photo to the map. Let’s keep your own name private. Visit at least FIVE Washington libraries, two of which must be at least 50 miles from your home. Take a photo — a selfie, a shelfie, or anything that catches your interest — at each library you visit. Go to the Passport to Libraries web app, enter your code name and location, upload your photo and something about that library. Your photo will appear instantly (and magically!) on the map of Washington. Show off your photographic skills to make each library shine. Feeling competitive? Be sure to visit at least 5 libraries; make sure at least 2 are 50 miles from home. *You can instantly get a photo on the map, but you’ll need to register to be eligible for a bookstore gift card. A Passport to Washington Libraries is sponsored by the Washington Center for the Book, with support from the Washington Secretary of State’s Office. 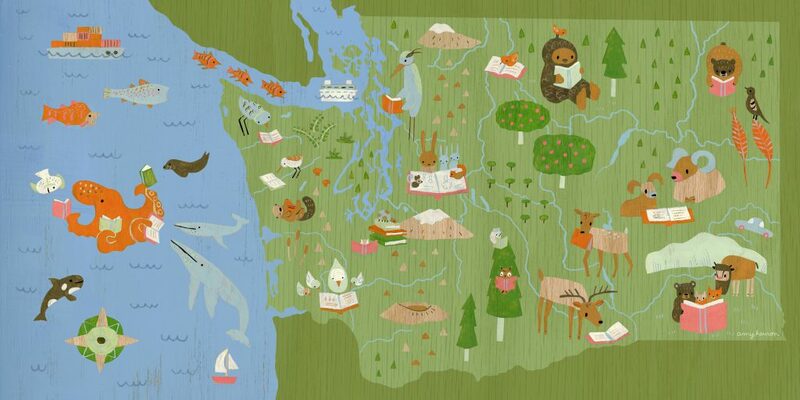 Let’s fill this map of Washington with your photos of the libraries you visit!